After getting a container, choosing plants that will like the container, setting up the layers of drainage material in the bottom, appropriate soil for the plants and possibly some top dressing like stone or sand, it’s fun to consider decorative add-ins. These can be an accent to the plants or they can tell a story in which the plants play a supporting role. The people at http://twigterrariums.com are brilliant at creating little scenes with tiny people doing different things, check it out! So far I have preferred to just accent my plants with decorative items, but I think this is mostly due to the fact that I haven’t come across a great resource for tiny people! Here are some things I’ve recently collected. 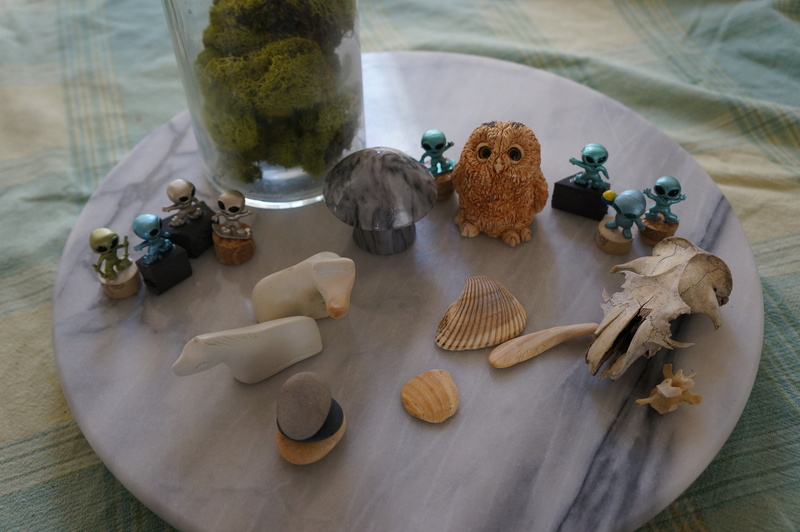 Some of these items are larger, like the owl with the intense glass eyes the marble mushroom, and the real animal skull I found in the woods. They will need a larger terrarium. 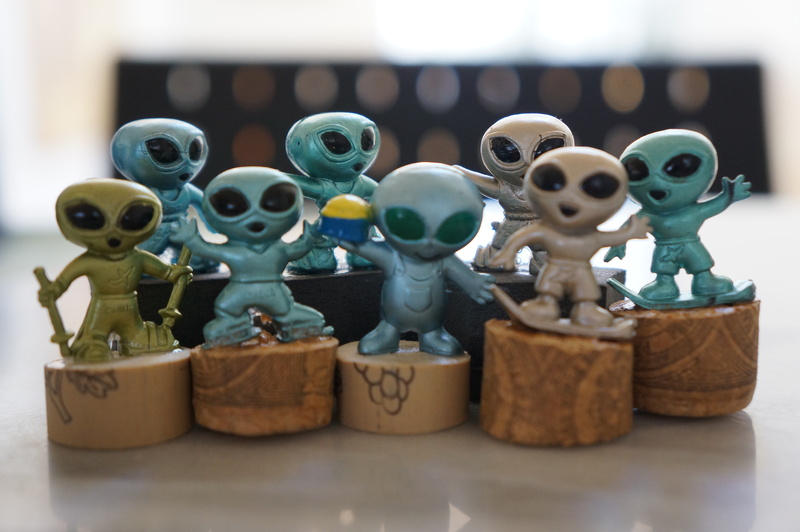 Some are smaller like the little aliens ($0.10 for all at a rummage sale!) I had to glue them on corks because they wouldn’t stand. I’ll just sink the corks into the ground and no one will know I had to do that. I’ve also got shells and a stack of small beach stones. The jar has deer moss in it. This is natural moss that has been preserved so it is technically dead, but so full of bright green color you’d never know. Tucking a little piece of this in really jazzes it up. When I visit one of my usual haunts (Goodwill, St. Vinnie’s or rummage sales) I’m always on the lookout for certain categories of things. Tiny terrarium add-ins are one of those. Have you found anything really interesting to put into your terrariums?